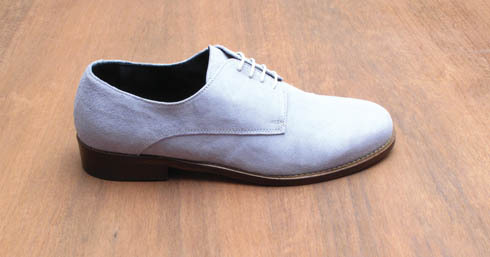 It’s pretty simple: Tristan Blair makes shoes that you need in your life. His designs are everything that’s lacking on the market right now: they’re adventurous, kooky and totally on-point. Blair’s creations are skilfully made, with complex architectural shapes paired with way out textures and dreamy colours. Balancing out the more daring designs, Blair consistently revives classic forms and styles season after season. 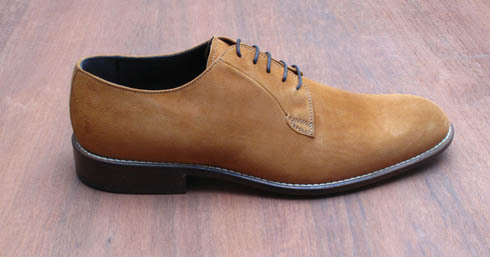 As often noted, Perth-born Blair started out in his family’s construction business, then sort of fell into shoe design. Quite simply, he is like no one else in the game. It’s easy to see why Tristan Blair has such a strong cult following both here and overseas, especially on every fashion blog worth reading. His designs offer something that you can spend a lifetime searching for: the perfect shoe! I spoke to Tristan about his new collection, autumn and… fishing week. Fleur Mitchell: Tell me about your new collection, what’s the inspiration behind it? Tristan Blair: This season I have kind of laid off the women’s shoes a bit in aid of producing a men’s line. 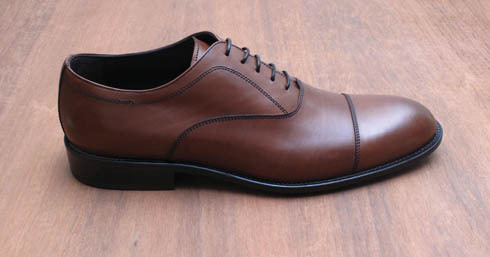 I have still worked on a few women’s designs but they are based on the men’s shoes. My inspiration for this season comes from my grandfather’s obsession and immense skill at polishing shoes. He was a avid fan of having a respectable shine on his shoe so much that when my brothers and myself would return from school he couldn’t get our school shoes off fast enough to get them ready for the next day. Max (Grandad) always had great style and was well presented as most of that generation are, so I have looked at this for my inspiration. FM: What were you like as a kid? Did you always have a bit of a thing for shoes? TB: Yeah I did, but from my answer before you can understand why. My father is also a advocate of the ‘good quality shoe’, I guess it transpassed the male gender and left me with a distinct interest in footwear design. FM: How do you navigate the world of fashion… do you like being part of the industry? TB: The industry has its good sides and bad as most do. I try to get what I want out of it, which is a canvas to express my thoughts. So it’s great for me. Yeww, fashion! FM: We don’t have that many visible shoe designers in this country, especially with such a cult following as you have overseas. What do you see for the future of shoe design in Australia? TB: Australia would really benefit from a small manufacturing industry with some skilled workers. I think then we could really become a strong contender in this contingent of the industry. Unfortunately, until this happens, I don’t see that many people being able to bridge the gap but I have been wrong before and I am sure someone will prove me wrong. FM: What’s the design process like? How do you go from a spark of an idea to rough sketch to final product? TB: It all happens via the hand, then is scanned and put onto the computer to be retouched. FM: What makes a good pair of shoes? FM: How do you balance fashion versus practicality? TB: The balance is not really something I try to consider. What I do is do a bunch of prototypes and then discuss it with friends and my agency. Through that process, we try to narrow down what is going to work and what should be left in because of its uniqueness. FM: Your designs seem to provide exactly what is otherwise lacking out there at the moment. How do you know what women are after? Do you consult your friends? TB: Thanks, I just do what I feel like! I suppose I am inspired by my surroundings.? FM: Speaking of inspiration, who or what inspires you? TB: No one in particular, I am inspired by the world and how awesome it is. FM: What do really love at the moment? TB: Autumn. I am overwhelmed by how good Autumn is. I love this season. FM: Do you think you might branch out to do something else, perhaps other accessories like bags or even clothing? FM: What’s a typical day for you like? TB: I wake up, walk to the coffee shop, think along the way, then sit in front of my computer, go drive around, do something obscure, obsess over something, get home, read my emails, reply to emails, fish in the afternoon, then start cooking dinner. FM: And lastly what’s next?